Juco Fabric is a new and exciting material technology combining the strength and natural properties of jute with the finishing and texture of cotton fabric. Juco is generally advisable for fashion and retail bags. Manufacturer, exporter, and supplier of Juco Bags. It is smart, versatile and increasingly popular new ecological fabric. The fine blend of both jute and cotton give Juco an edge on both materials, by taking the most beneficial properties of each it offers an ecological alternative to cotton and canvas bags. 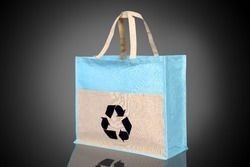 This makes the perfect shopping bag, these are highly eco-friendly and reliable for a longer usage. Available in latest colors and patterns, these suit the diverse requirements of our customers.